I lamented the closing of Lundum’s last year, a Danish restaurant which previously occupied the beautiful red-brick Edwardian building at 119 Old Brompton Road. It was a lovely spot – luxurious and comforting. The food was delicious, and the dining room with its cream walls, charming staff, and candle-lit tables, set the scene for cosy, intimate dinners. However, good things must sometimes come to an end. But in its place has opened Ambassade de l’Ile, the London outpost of Jean-Christophe Ansanay-Alex, a Chef who owns the 2 star Michelin restaurant in Lyon of a similar name (Auberge de l’Ile), and who was once the personal chef to Christina Onassis. Ambassade de l’Ile opened to some unfavourable reviews from certain members of the written press. Although it’s not unheard of for such negativity publicity to kill off a restaurant no matter how good the food, it has managed to hold on and earn its first Michelin star earlier this year, seven months after it opened. It has also won praise from certain food blogging camps that I follow, and with that, it felt like high time that I went off to explore. The restaurant has undergone a total transformation. Gone are the homely, soft tones, and in its place are purple padded walls and white leather buttoned chairs. The contrast is striking for that fact that the walls are so dark, and the table settings so light. In the words of one of my dining companions, it was reminiscent of Sketch Brasserie, if more for the feel than the look itself. We embarked on the tasting menu that was of our own creation thanks to the Chef who kindly permitted us to put it together by choosing items from the à la carte menu. There were many tempting morsels, which made the decision quite hard, but on this occasion I decided to succumb to the whims of my dining companions. The tasting menu costs £70, but for the purpose of this write-up, I have also included the à la carte price where relevant. We began our meal with amuse bouches of goat’s cheese croquette with marmalade, and a cod brandade smothered with a beurre blanc sauce. The coating of the croquette was light and crispy, and the filling of cheese was creamy and delicate. And the marmalade, which packed an intensely fruity, yet subtle, flavour provided a lovely contrast against the richness of the goat’s cheese. The brandade, a specialty from Languedoc and Provence, is a puree made from salted cod, olive oil and milk. Here it was pleasantly done with a lovely flavour. First up was the consommé de tomate au basilic comme un Irish coffee. 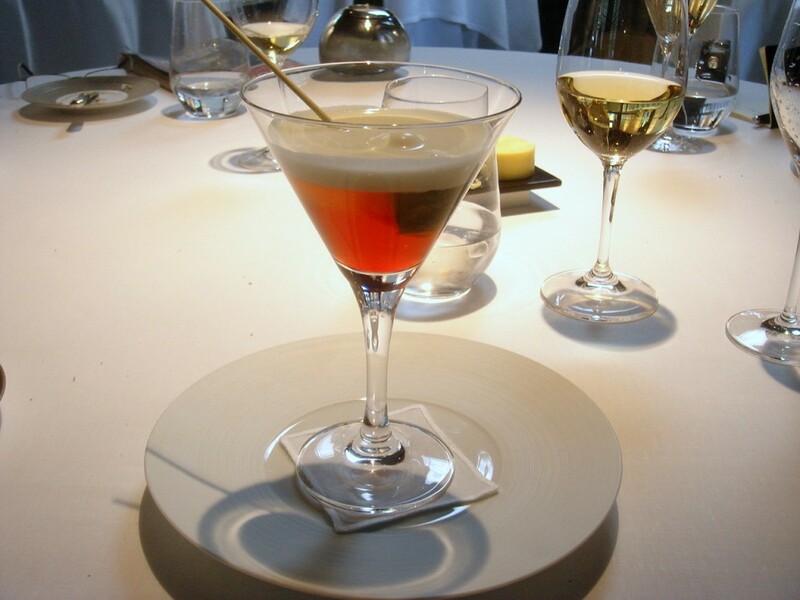 A consommé of tomato and basil, the reference to Irish coffee alluded to the fact that this was presented in a large martini-shaped glass, and topped with basil foam. I must confess I found the overall spectacle of the dish alluring, but while the consommé tasted pleasant, it lacked a strong flavour of basil. It was accompanied by a small piece of tomato, which had been dipped into the consommé, smothered with caramel and perched at the end of a stick.. This was rather unwanted, as the caramel was quite sweet and worked against the savoury tones of the consommé. Ravioli de St-Jacques et langoustine, agrumes, asperge et lait au poivre (£24), a dish of langoustine and scallop ravioli with asparagus, pepper and citrus coulis, was uninspiring. The pasta was a little overcooked, and the filling bland. 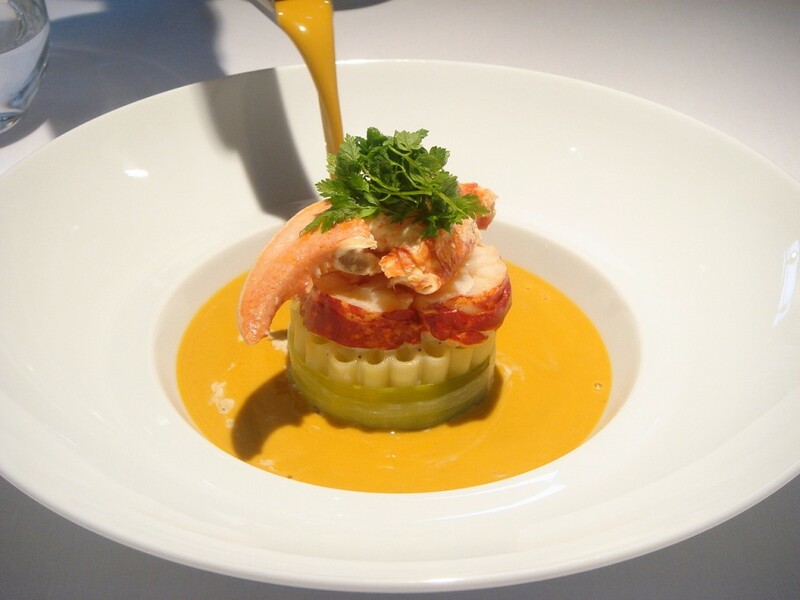 The mushiness of the centre made it difficult to discern between the flavour of the langoustine and that of the scallop. However, the tartness of the citrus coulis, which was ever so slight, was an interesting contrast to the dish. Carbonara de homard (£30), a native lobster “carbonara” was perhaps deceptive in its description, for it wasn’t so much a carbonara in the Italian sense, but rather, pieces of lobster mounted over macaroni, and bedded with a lobster broth and a piece of lobster claw on the side. If there was one dish which achieved spectacular status and drew gasps of awe, this was surely the one for the day. The lobster was of the highest quality, meaty and succulent; the pasta was extremely well cooked; and the sauce was creamy and decadent, with a lovely lobster flavour. 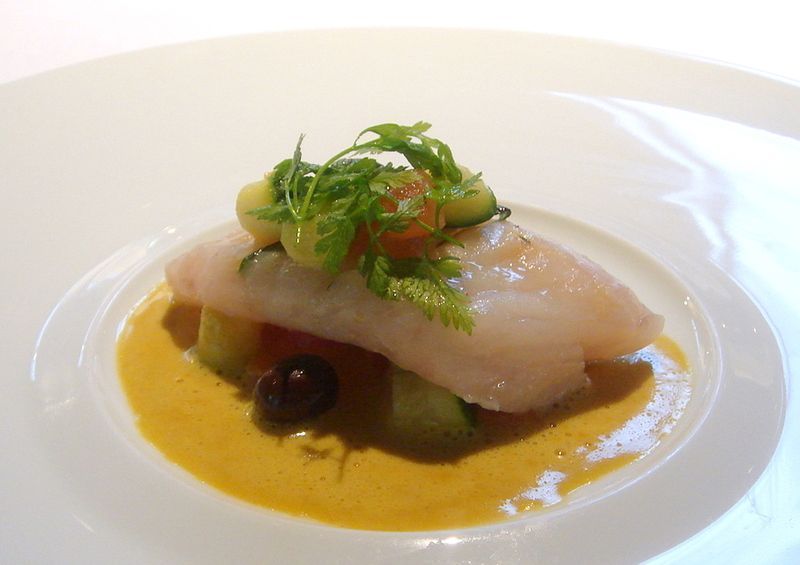 Dos de St-Pierre tigré de basilic, curry, courgette, tomate confite et olive de Nice (£27), our fish course of John dory, basil, curry, courgette, confit tomatoes and olives was lovely and executed with technical precision. The fish leaned towards being slightly underdone, which I personally prefer, and which has the benefit of keeping it moist. Being of extremely good quality, it was succulent and meaty. The vegetables were lovely and the curry flavour in the sauce was so subtle that it provided only a hint of the spice. The dish was a joy, with my only quibble being that the olives were not pitted. 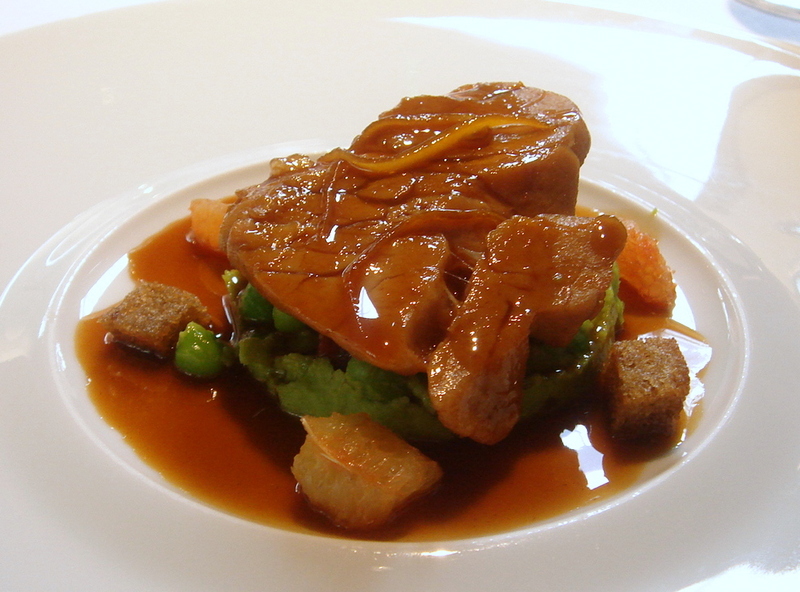 Pomme de ris de veau lentement braisee au pamplemousse rose et petits pois (£27), a dish of slowly braised veal sweetbreads with grapefruit and green peas resoundingly won the table over. As the description suggested, the sweetbreads were braised rather than pan-fried, which led to an altogether different result, one which was quite tender but perhaps less creamy than pan-fried versions. It was flavoursome and robust. The grapefruit added a lovely kick to the dish, and along with the peas provided hints of summer. Croutons were also used in the dish, and added a crunchy textural contrast to the softness of the sweetbreads. Dessert was soufflé a la peche blanche (£14), a white peach soufflé, which was textbook perfect – light and fluffy, but not too eggy. 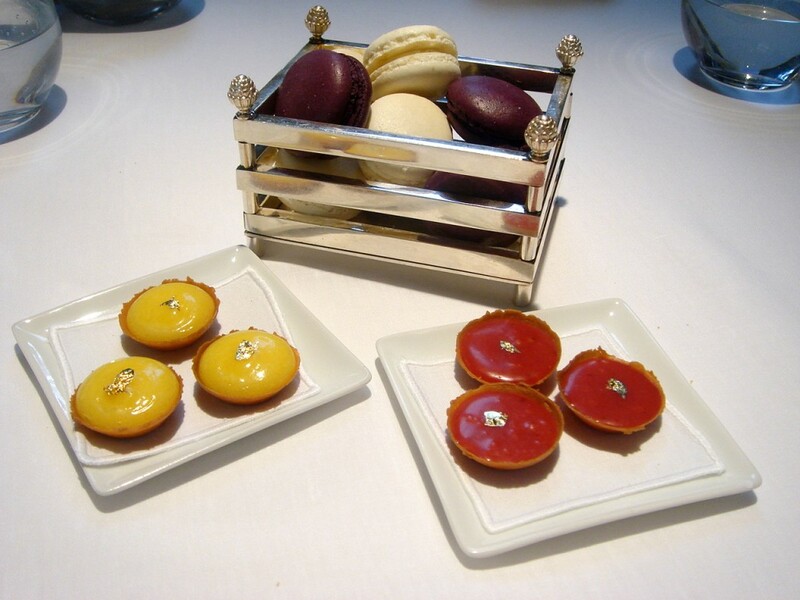 For petits fours, we were presented with miniature lemon tarts, tarte aux pralines roses, (a pink praline tart made from sugared almonds) and blackberry and vanilla macaroons. The lemon tarts were excellent and of the requisite tartness; and the pastries on both the tarts were exquisite, being light and crumbly. The macaroons were crispy on the outside with soft, slightly gooey centres. Both flavours were delicious, although the vanilla one was cold in the centre, and perhaps could have been left to warm up for a little longer before serving. Breads were made in-house and lovely with a crunchy exterior. I found no fault with the service, and overall, the meal was a demonstration of masterful execution. Although I questioned the inclusion of the caramelised tomato in the consommé, and I thought the ravioli to be only an average dish, all of the other dishes were highly pleasing, with the lobster a true highlight. For £70, I thought the price was reasonable for a tasting menu. The restaurant is truly worthy of a one Michelin star, and with a monthly changing menu, I left feeling that one visit was not enough to explore all the delights that Ambassade de l’Ile might have to offer. 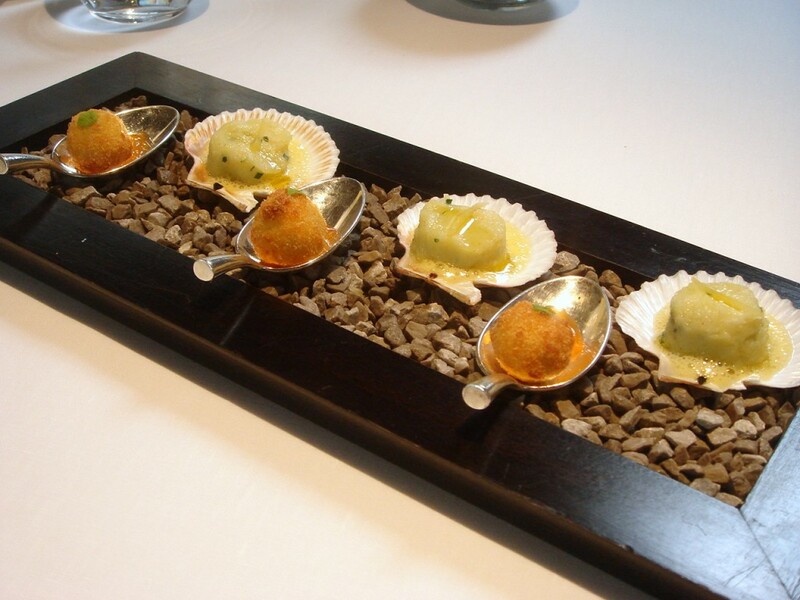 Price – The 3 course set lunch menu is £25, the 3 course dinner menu is £45 and the tasting menu is £70. Excludes drinks and service. I think this tomato consomme and the raviolo really were a bad start to an otherwise great meal. Great review! When the white peaches are in season, I am definitely making that white peach soffle! Yum! I agree whole heartedly – Ambassade is the one restaurant I would gladly return to time and time again. Case in point, I had such an amazing meal in November that I returned pretty much the next week to try more of the food. 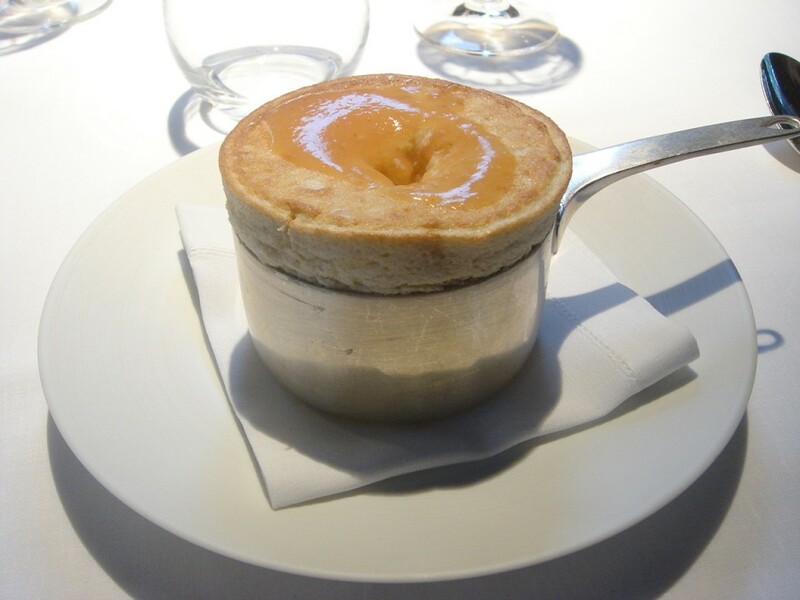 The peach souffle sounds amazing – and seems like you have found a restaurant you really liked overall. Wow fantastic that you could put together your own tasting menu – virtually unheard of!